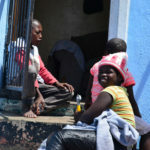 Seeing the number of kids roaming the streets during the day, Pumla Gigi decided to help her community by opening the doors of her house in Mfuleni. Her ad-hoc day care center soon became a full-fledged pre-school. As of 2015, Ubuhle is under new leadership, but it has only continued to grow: the education center provides early childhood education to almost 200 children in three different facilities. Ever since CHOSA began working with Ubuhle in 2007, we have provided the center with capacity-building support, networking opportunities, and a monthly grant. While the grant is technically unrestricted, Ubuhle has decided to focus the grant specifically towards salaries for their teachers and structural improvements to the school buildings. Ubuhle’s current dream is to find a way to own the land where the pre-school buildings stand and then upgrade the informal structure to permanent building.